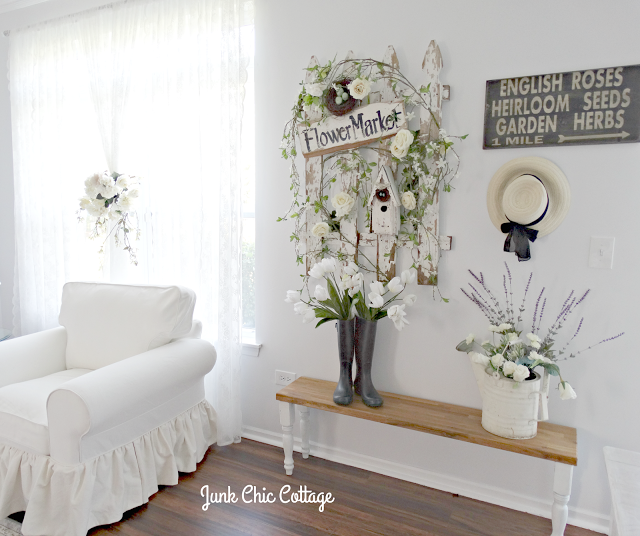 The Cottage Living Room Reveal. Welcome to the cottage living room. With light streaming in this room all day I try my hardest to get a good picture without it looking too washed out. My living room is in light gray walls, white and creams for my slipcovers and of course all my chippy architectural pieces. This old vintage door I had in the other house fit perfectly for the entry closet door. Stairs After the carpet was removed and the treads re stained along with the stair rails. 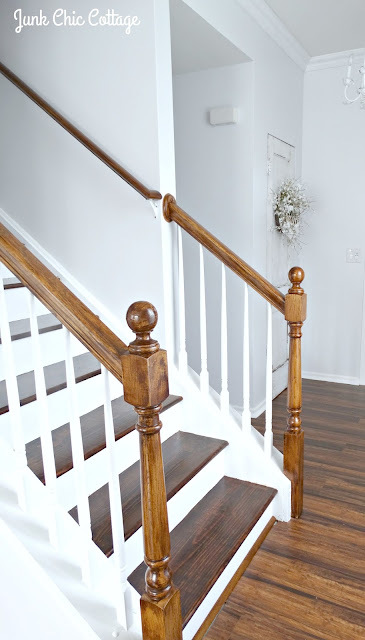 The spindles and risers were painted white. Corner living room used for my new office area. I had this cute garden plaque. It is open in the back and fit perfectly on top of the thermostat. So if I need to get at the thermostat just lift. Easy Peasy. Shout Out to the Very Talented Lisa Harmon and her slipcover creations. I just love Lisa and how she can sew the most beautiful slipcovers. I have shown her work before and this time I have something kind of fun that she did for me. I am on a tight budget with Terry not employed yet so I needed a new chair to go with my white slipcovered sofa that Lisa had covered for me last year. To make it affordable I got the Ikea Ektorp white chair and cover. Then I sent the cover to Lisa and she did her magic and made the boring plain ruffle on this chair into a more cottage custom ruffle. 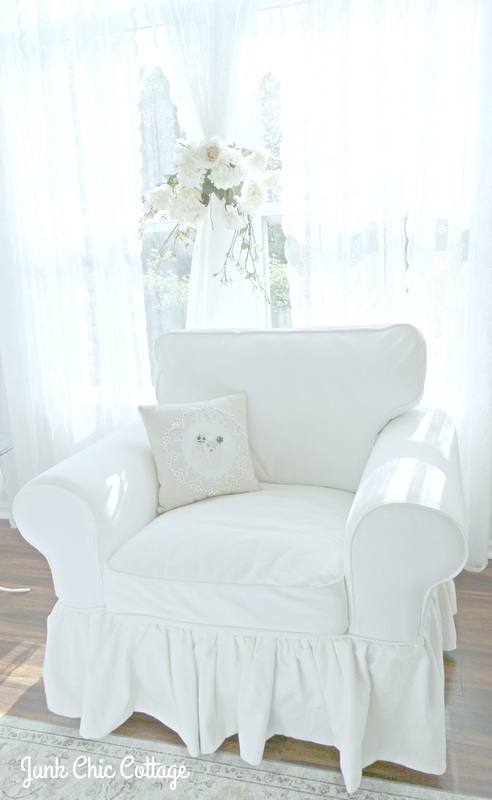 Just adding a simple ruffle to this ikea cover gives the chair a more custom look. Look who else thinks the ikea white chair is comfy!!!!! Look at the look on his face when I took his picture lol! Hey I am trying to nap here!!!!! Lisa did a double ruffle on the Ikea ottoman cover I had to go along with the double ruffle she did for the sofa last summer. Lisa's creative sewing gave my living room pieces a custom look. If you need a good slipcover or need an existing slipcover updated Lisa is your go to person. Here is her website and Etsy. 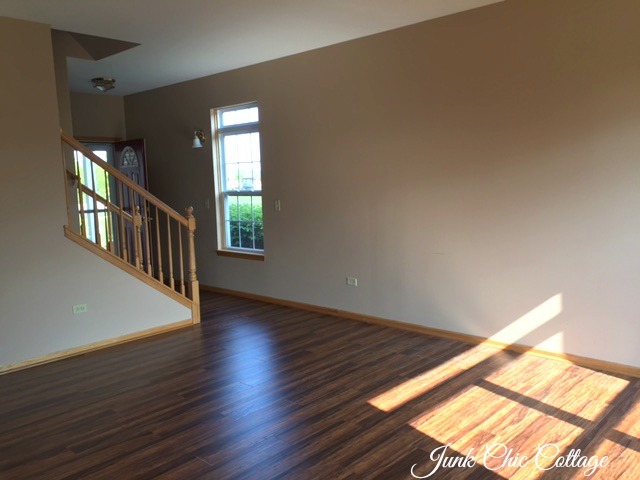 Thanks for coming by to see the living room transformation. It is still a work in progress but it is coming together nicely. I will have the kitchen to show you next and Terry's Fireman Cave. It is beautiful! So much light coming into the room. What a difference! Looks awesome.....and you two have been working really hard! Gosh to have gotten done so many rooms already. Can't wait to see your kitchen...Love the light coming in to the room and can appreciate how hard it is to get a good photo with it. No worries all you pretties are showing! Love how the staircase looks now! awww your puppy loks sooo comfy, look slike he's got the best seat in the house!!! Gorgeous spaces!!! Love what you did to your staircase! Y'all have done an amazing job!!! 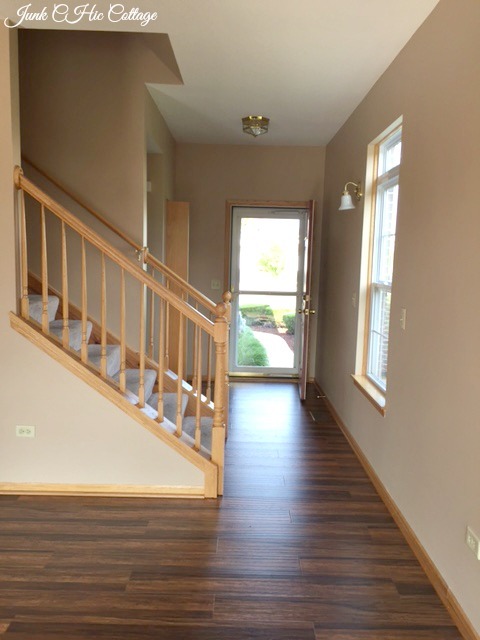 The before and after of the stairs is so impressive! You had a vision and brought it to life so beautifully. Love all the light and bright spaces and your chippy pieces are the icing on the cake. Beautiful! Kris, your new home looks totally amazing! I am wowed, but not surprised. You always do great work. Congratulations on your new place, it really is home sweet home...and btw, I am so impressed with the ruffle on the Ikea cover. Genius! I am totally doing that!!! Oh, the magic you and Terry create - it looks like you have lived there for years! I love that you had a fun vintage door to replace a stock condo door in your entry and Cooper looks right at home in his new digs! Kris, each room gets better and more better, not prettier though. They are all prettier. Love it and I think the small space does justice to your whites. Everything stands out individually. So pretty. Can't wait to see the rest..Happy Day..xxo Judy P.S. Stairway to heaven!! Love it's new look..
What a difference, Kris! It's now so light and bright and you. I love the photo of Cooper in the chair. It's like you've always lived here! So beautiful Kris! Your living room is spectacular. I just knew that you and Terry would do a terrific job on your new home. Everything is perfect. Cooper loves that chair. Thanks for sharing and looking forward to seeing the rest of the house. Oh, the sunshine! Absolutely lovely!!!! You truly have a special talent when it comes to decorating, Kris! It looks just like you and I am thrilled that you have a new home to enjoy. So perfect. Your home is coming along very nicely. Lots of work for you and hubby but so worth the doing. I tried to go to Lisa's website and Etsy site but the links aren't working for me. Can you send them to me? Her work is just beautiful. GORGEOUS!! Your home is coming along beautifully - just as I knew it would. You have such fantastic taste. Your home is so you. Love every detail!! I love it. The stairway and banister look great. 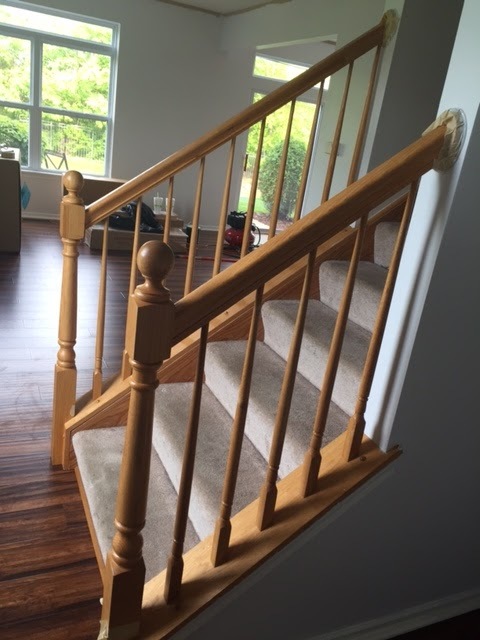 What stain did you use for the handrail? I love the closet door too. It's perfect. I love slipcovers. Fabulous. Everything looks beautiful Kris and your special touches are everywhere. You've done a great job! Love it all! What an amazing transformation! Your light walls and furniture make all the difference! Love what you did with the stairs. 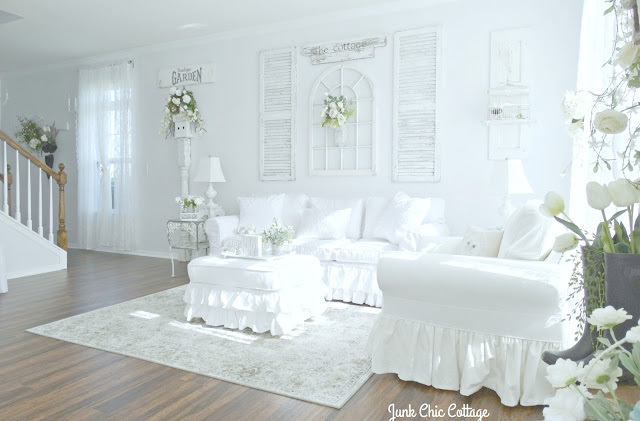 Your family room looks so pretty! 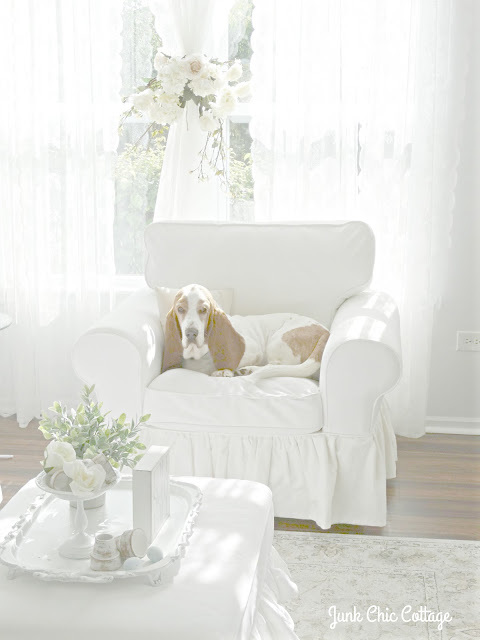 It looks like you get a lot of nice light in your home which makes your white fabrics look even better. I'm so impressed with everything you and Terry have done and in such a short amount of time. It's really beautiful,Kris. I can tell Cooper is enjoying it too! Your new home is so beautiful, Kris! I'm so happy that you finally got moved in. I can see you've been very busy. What a gorgeous update! The light in there is wonderful on all your beautiful furnishings! You always know just the right amount of wood tones to go with the whites. And Cooper looks oh so handsome right in the middle of it. I must look for something like your thermostat cover. In my bedroom I tacked a sunhat over all the electronic stuff that kept me awake at night with its green lights. Surely I can think of something better than a hat! I adore your ruffles! They really give a custom look to the Ektorp! Oh my GOSH!! The transformation of your living room is incredible, such a vision you have!! I love the light and airy look, I can't wait to see what else you're gonna do. You have a true decorating gift! Nice job!!! Wow, what a difference you and Terry have made to your new home. 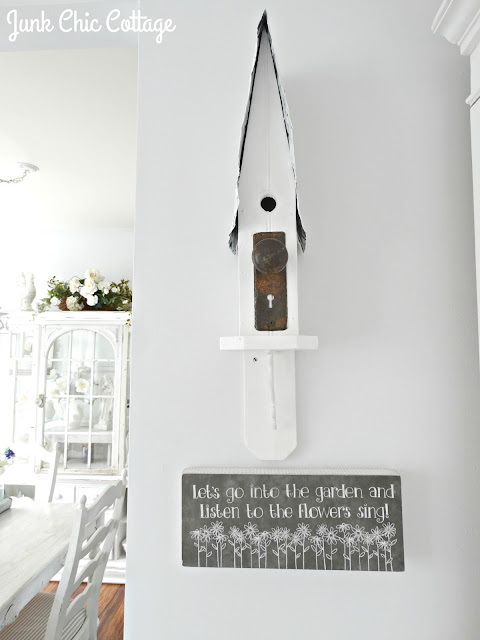 It really has your style stamped all over it now and I love it... as I bet you do too! The stairs turned out brilliantly. I AM SO TICKLED. Every shot you took really reveals the hard work, creativity and love you put into this new home. And your chippy door fit PERFECTLY for the closet in the entry hall! PERFECTO! Cooper loves his new home. He loves that sunny area, I can see on his adorable face!!! Kris, you made it through. It was a tough time with all the waiting, but in what seems like no time at all, you accomplished so much. Much love to you and Terry AND Cooper the super duper dog! Wow, what a difference! The room looks so much bigger. You've done a lovely job in your new home. Perfect. Our stairway is done in the same fashion, and yours turned out great. Looks 100% better than the before. Love how Cooper claimed the chair. Everything looks just beautiful! Love the before and after shots... Cooper looks so comfy. It looks outstanding and so YOU! Happy that it is all coming together for you. Looks fabulous Kris. :) I wish you would share your transformation at our Share Your Style blog part on Thursday. Opens Wed. evening at 7 pm. Your sweet pup looks very happy and comfy. Kris, this is just beautiful! I love the vintage door and all your chippy pieces. Lovely job! Thanks for sharing. Wow you sure have transformed your place. I feel like we're back in your old home. Beautiful work your doing! Prayers for a job soon. LOVE, LOVE, LOVE it!.....beautiful room Kris....your gorgeous signature style...and love how you changed out that door..perfect!....I do have a question...love how you covered that thermostat....but does it interfere with the temperatures in the room? Kris, this is gorgeous your home is so you. I love light you get. Aren't you a smarty pants with your picture hiding the thermostat. Cooper looks comfy. Hi Fiona I found that sweet rug at Home Goods. Hope that helps. 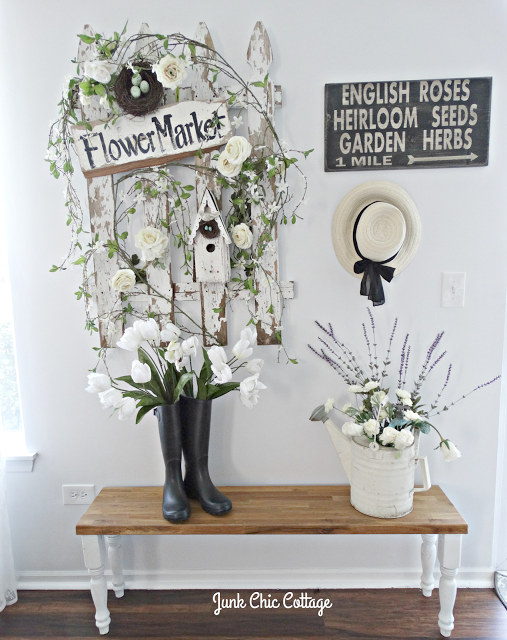 I have been MIA for awhile with our move and am just getting a chance to get caught up on your blog now...and oh my gosh you never disappoint with all the beautiful photos! I love your new townhome and the outside photos with all your touches are so pretty, and you are right we really don't need all the space of a big home...we will be downsizing and it is something I am looking forward to! 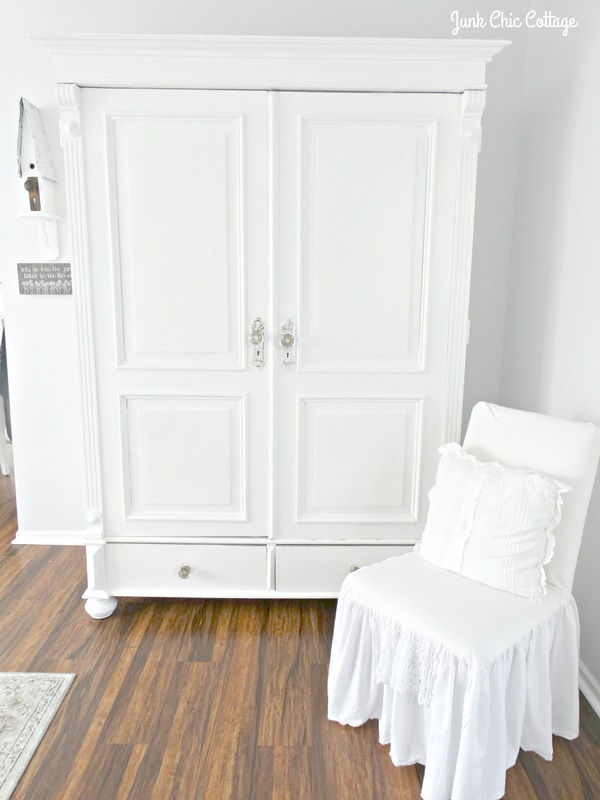 Love how you turned the armoire into your office - an amazingly creative use for a small space! The stairs turned out so beautiful and the slipcovers too! I love it all!! I was so sorry to read about Cooper, I didn't know that he was sick...it is so amazing that he found you/you found him, I pray that the medication can keep him going and comfortable! Kris, wow! What a difference! You took an ordinary room to extraordinary! 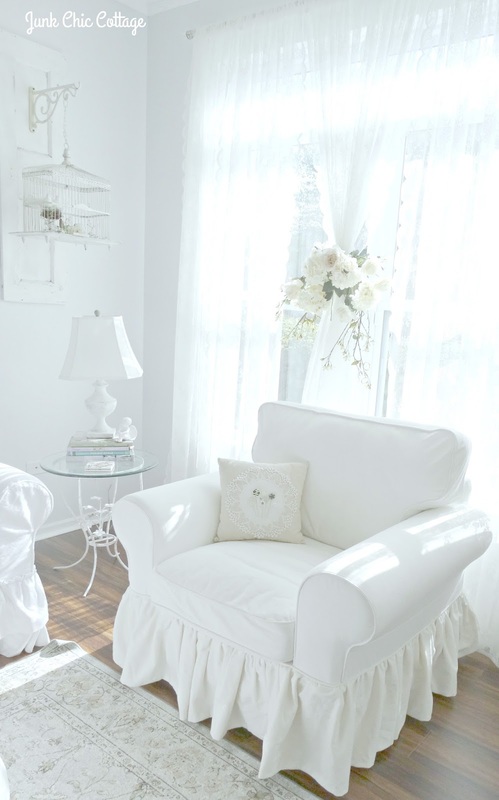 It is so light and airy; so welcoming. 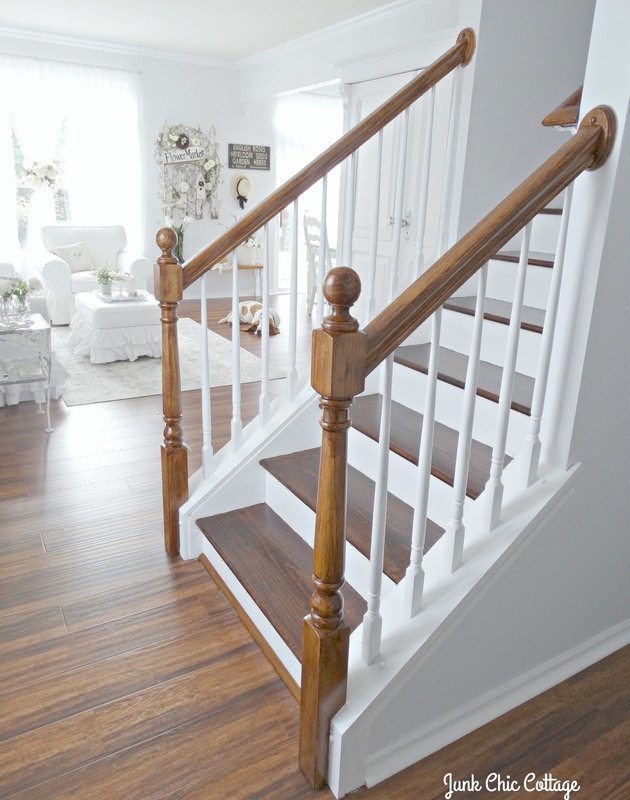 The transformation of the staircase made a dramatic change. Hello sweet Kris! Well for anyone who wondered if you would be able to replicate the essence of Junk Chic Cottage 1 in your new home they must be pleasantly surprised. But I knew you and Terry would recreate your old home ( beautifully recreate ) with warmth and love. 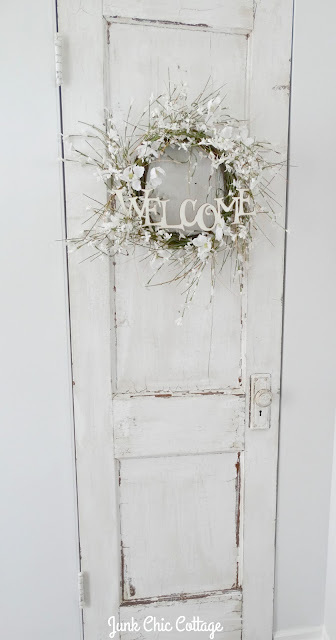 I love that you used the vintage door on the entry closet door. I am going to look into your slipcover friend, I'd like to have a Summer white made for my living room sofa in tailored European chic. 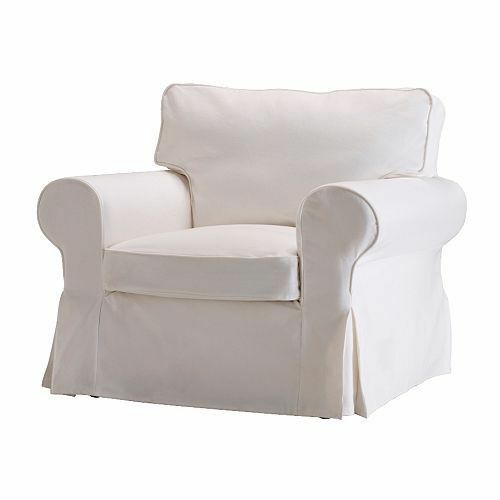 There is just something refreshing and charming about slipcovered pure whites in the Summertime. Heck at least I will spot Simon before I sit down because he matches the grey of my velvet sofa, lol. Oh Kris I love seeing photos of Cooper give him a thumbs up for me for enjoying his daily life with his earth angel Mom Kris. Your blog is one of my top three favorite blogs! I love your decorating style but wonder why you don't have a PinIt button on your photos? I get so many ideas I want to incorporate into my home but become frustrated that I can't pin them. Any chance you would consider adding a PinIt button in the future? I'd be ecstatic if you did. Hi Glenda. Thank you so much for your sweet comments. I do not know how to do a pin button on my pictures. If you can tell me how I would be glad to do that. I am so not computer savvy to know how to do that. Add your Pinterest icon to the post. If you have trouble, I'll bet you could ask any number of your fellow bloggers for help since you have a huge following. Keep the photos coming! I just discovered that you live in Lake Zurich - about an hour from me in Racine WI. Perhaps we'll have to set up a time and date to meet personally. I'm often in that area antique shop browsing. One of my favorites is Gurnee Antique Market and their summer sale begins this Monday (6/20) and runs through Sunday, 6/26. I did that and if you go over my pictures now you will see the pinterest button come up if you want to save any of them. Somehow though the round red p does not just appear on the pictures. You have to move your mouse over the picture to see the pin it. I am working on that not sure why it is not having the pin P show up on each picture. You can pin them now. We moved from Lake Zurich and live further south now. New Lenox is where we just got this new place. About 1.5 hours from Lake Zurich. I have to change my profile. We moved into our new nest a little less than a month ago. Thanks for finding the code research. I found it too and did it exactly as instructed but for reasons I do not understand the pin p does not come up on the pictures. I will figure that out but in the mean time you can pin away. Thanks, Kris. I'm not sure why the red PinIt button isn't appearing on your photos but there is a PinIt link that appears on the bottom left portion of your pics and it works. Yes, I knew you had recently moved but didn't know how far you had moved from Lake Zurich. Sorry we can't meet personally but I while continue to follow your new "digs" decorating with great anticipation. And do keep all your followers informed on Cooper. I got some bad news this week - my sweet little 8 year old Yorkie, Gracie, has developed heart disease. I know what it is like to watch "our little ones" begin to slip away. So far - after $2000+ in vet bills - she is doing well and it is too soon to determine just how long the vet thinks she has left. But she is feeling well and is her sweet, normal, adorable little self. However long it turns out to be, I will savor every moment, just as you will do with Cooper. Oh no about your little Gracie. I hope if they are treating her with meds they are helping. Yep we just have to love these little sweeties as long as we can. Hoping Cooper gets lots of good days ahead. So far so good. His prognosis was weeks maybe and now we are going into the 2 month mark so we are hopeful. Have a great week end. Glad you could pin. You really pulled your living room together beautifully, Kris. It looks so fresh and pretty. 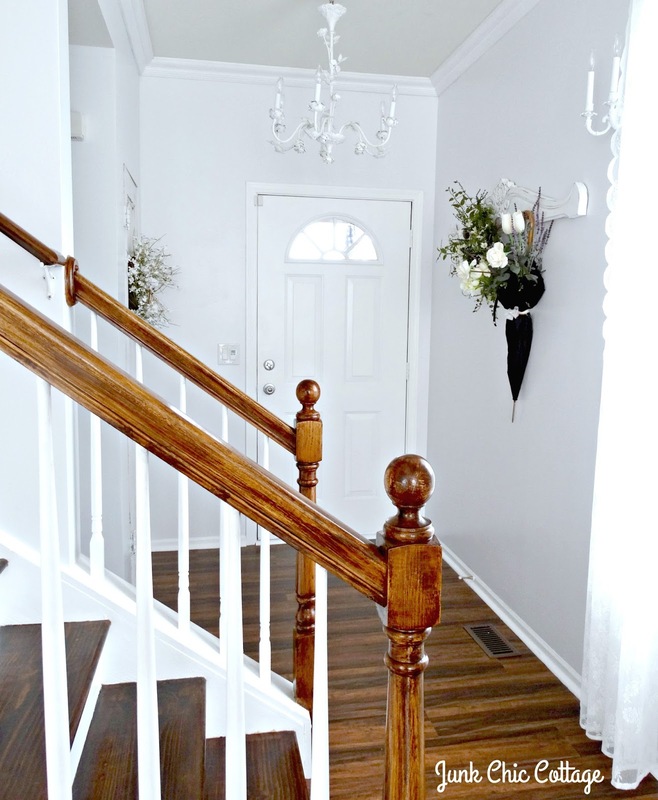 Love how you transformed the stairway too. 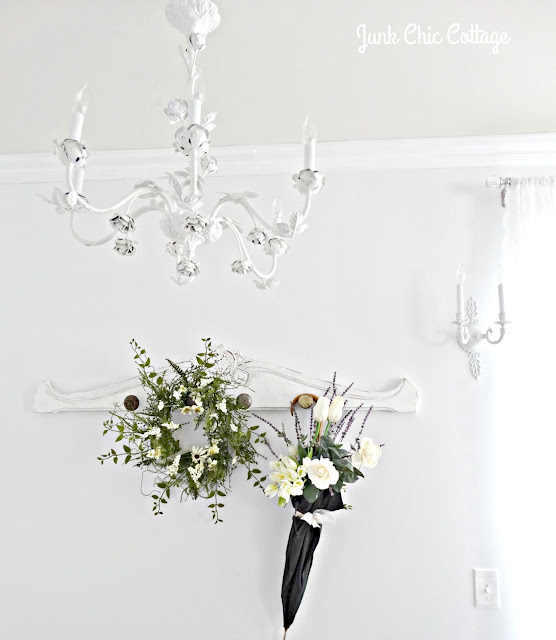 And that closet door in the entryway...Love! You have definitely put your lovely stamp on your new home. Love how the stairs look. Lovely home though I myself would like more color as too much white looks so sterile to me. So lovely and bright and cheerful no Kris and so YOU! Oh my goodness- everything looks fabulous - the stairs are beautiful as well as everything else - you and your husband are so creative and talented. 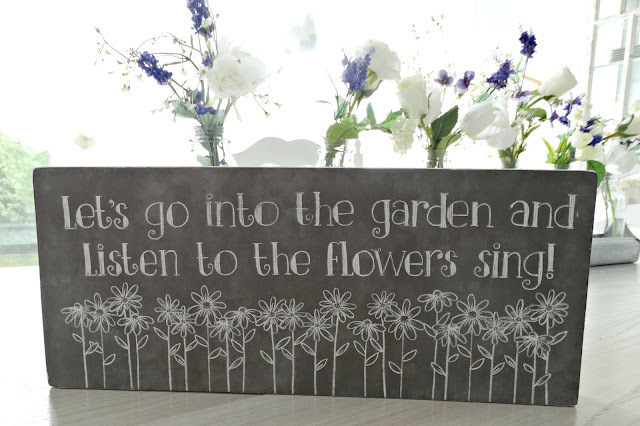 Your garden is charming and all of your pretty things fit perfectly. So happy to see your pup is feeling better and enjoying the new chair. Can't wait to see the rest of your new home. Very pretty....and most importantly...it looks like you! Wow, you two are good! I was surprised to see you already did the staircase too. It all looks beautiful. We have the same area rug. 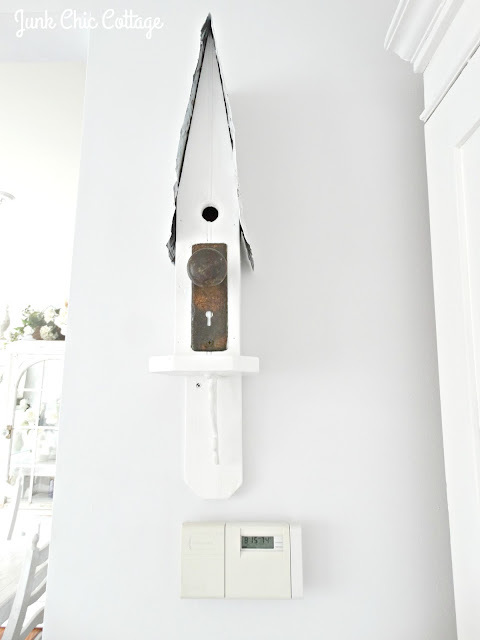 Love your thermostat trick - just might steal that idea and make my own version for our house. Looks like you guys are ready to start working upstairs now! You transformed it so beautifully, Kris! Love the work Lisa did for you, too...personalizes the furniture so well! Wow! It is so beautiful. You're right the slipcovers totally make the look. Hello Kris...I had to come and catch up on your cottage, yard, office, and Cooper. I've been off for a bit....Crohn's flared up again. You and Terry amaze me with your talents! Your home office is just too cute. I love the way it's all set into one cupboard, even with a chandelier inside! I think it's wonderful the way you two work together to bring your ideas to reality with such perfection! The yard looks beautiful, Kris. Love all the pinks in the flowers you've added to the landscape. 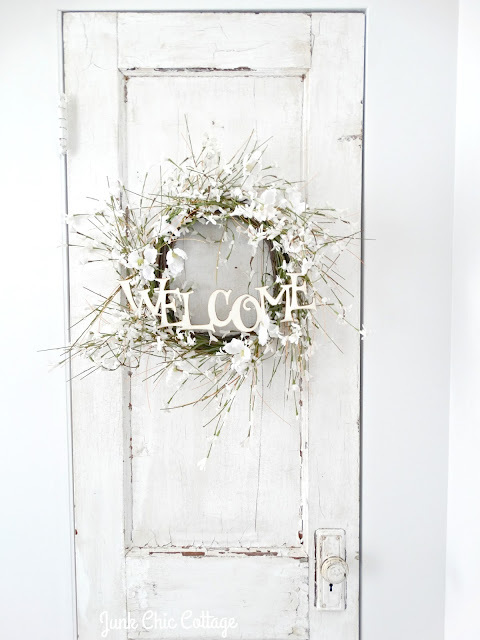 Your entry is very welcoming. The stairway turned out awesome! So neat the old door worked for the closet. Your living room is just gorgeous! Love, love, love it!! Happy to hear Cooper is doing so well. He deserves to be loved by such a family as yours. You guys are remarkable people! It looks like the move was a good fit for you, Kris. Your cottage is adorable! So beautiful, you very you! 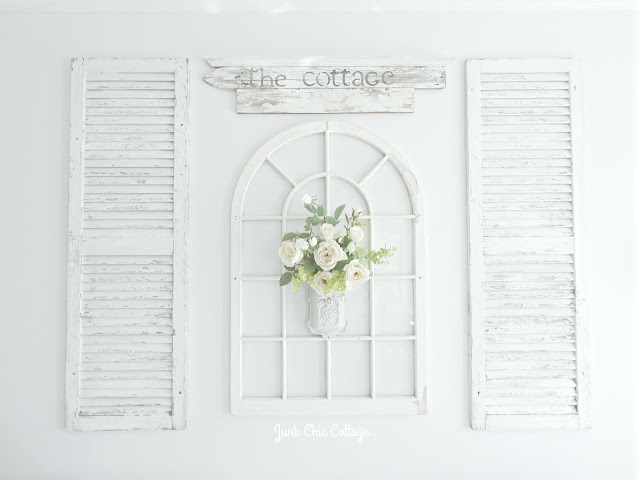 I'm not one bit surprised that you recreated your cottage look so perfectly. It's just wonderful- and look at sweet Cooper enjoying himself! haha xoxo, T.
Looking so fantastic. Home Sweet Home. Floors, not flaws and I wasn't even typing on my phone, so I can't blame my auto correct. I'm in love with your living room Kris, it has all come together wonderfully, you are just amazing! What a beautiful new home you have, Kris! You and Terry are truly superstars! I can't believe how pretty everything looks, and how cool that the door fit?! It was meant to be :). Love the thermostat idea, but am wondering if it affects the temperature? You've really done an awesome job transforming the room with your own style. It really looks like a charming home now. Wow you two have worked so hard to making it your own. Love reading your blog. Thanks for the inspiration. Kris, I love your new Living Room!! It's just perfect!! Thank you so much for sharing on Simple & Sweet Fridays. You inspire all of us! !